When a horror movie makes you feel like you need to go lie down for a while after you see it, that movie has done a good job. Pet Sematary will likely evoke that reaction for viewers with young children. I'm going to assume you know what the film is about, either because you read the Stephen King novel, saw Mary Lambert's 1989 adaptation, or simply viewed the trailer, which gives away the plot element that drives the story. (If you don't know it, read this review later on.) Directors Kevin Kolsch and Dennis Widmyer, whose Starry Eyes was an indie horror sensation a few years ago, have delivered a picture that gets under your skin, leaving you utterly rattled. Jason Clarke plays Louis Creed, a doctor who relocates his family to rural Maine. He, his wife Rachel (Amy Seimetz), and their two kids move into a beautiful country home with many acres of land attached. On their property, way out in the woods, rests a pet cemetery where locals bury their deceased pets. After the Creeds' cat is killed, their neighbor Jud (John Lithgow) takes Louis slightly beyond the cemetery to an ancient burial ground. Anything interred there mysteriously comes back to life. Sure enough, kitty returns the next day, a lot nastier than before. Then tragedy strikes. Daughter Ellie (Jete Laurence) dies in a tragic accident, so a distraught Louis buries her in the same place. That turns out to have some very unfortunate consequences. Kolsch and Widmyer have an incredibly difficult task. 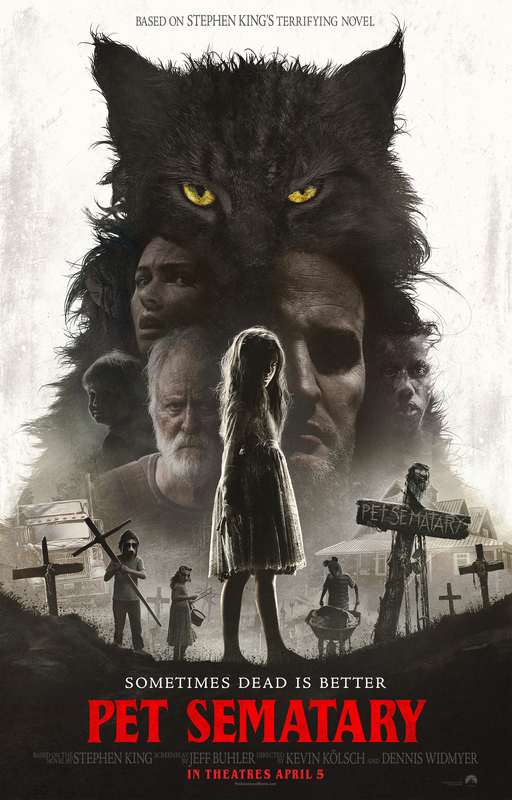 Pet Sematary is fundamentally about grief, and it asks the audience to ponder not only the idea of losing a child, but also of having that child return as something other than the innocent, loving kid you once knew. Go too far into the theme of child death and you risk becoming a complete downer that leaves people sad. The filmmaking team gets around that by delving in just far enough to unnerve you. From there, they create a fast-paced chiller with one suspenseful twist after another. Make no mistake – the movie gets seriously dark in its final thirty minutes. It doesn't get depressing, though. Pet Sematary has an effective sense of atmosphere that sets you on edge immediately and keeps you there throughout. The directors have clearly worked collaboratively with cinematographer Laurie Rose (Overlord) and editor Sarah Broshar (Ready Player One) to generate an eerie ambiance that pervades every shot. That sort of thing is crucial in a horror movie like this. If we don't experience a sense of dread, there's no opportunity to make an impact. Pet Sematary has plenty of dread. The performances really seal the deal. Jason Clarke is excellent as the grieving father, powerfully conveying how Louis takes drastic measures in an act of desperation, only to realize he's made a massive mistake. Amy Seimetz nicely shows the repulsion Rachel feels upon discovering what her husband has done, and John Lithgow is outstanding as the neighbor whose misguided good intentions set the whole situation in motion. As fine as they all are, the film doesn't work without Jete Laurence. Despite her young age, the actress achieves an ominous quality as the dead-but-not-dead Ellie. She might give you nightmares. Pet Sematary's biggest flaw is a terrible remake of the awesome Ramones theme song from the 1989 version. It also could have developed Jud's backstory more, given that it figures prominently into the finale. As a parent, the movie left me feeling shaken overall and I suspect other parents, in particular, will be similarly impacted. Kolsch and Widmyer plunge you into hell for one wild ride – which is exactly what you want from a big-screen Stephen King tale. Pet Sematary is rated R for horror violence, bloody images, and some language. The running time is 1 hour and 41 minutes.